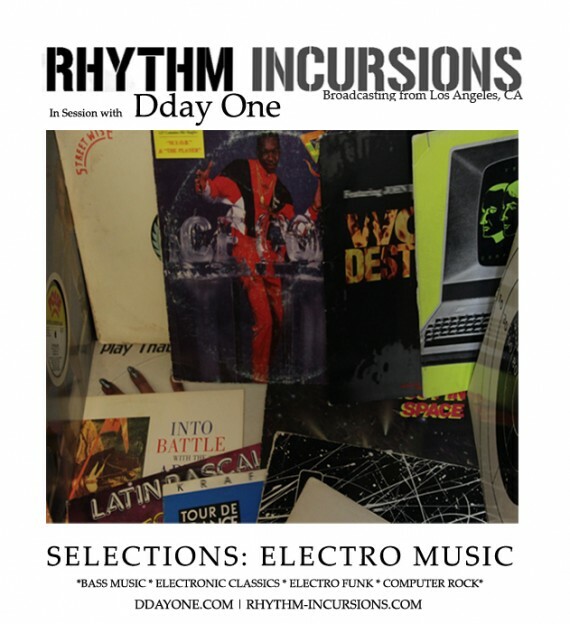 Hello and welcome to another edition of the world famous Rhythm Incursions “In-Session” podcast series with your host Dday One; broadcasting from Los Angeles, CA. This time we take a listen to classic Electro Music and pay tribute to the early “Beat Scenes” from around the world! Los Angeles Electro-Funk, Miami Bass, 80’s Soviet electronic music, Japanese electro, English electropop, Italo disco, French touch plus classic German bass music. In addition to the various styles (chop edits, computer rock, vocoder, 808 beats, etc) in this mix we also hear early works from the 2 Live Crew, Ice T, Dr. Dre, Kid Frost and Detroit techno originators Juan Atkins and Richard Davis. NOTE: As always subscribers to our RSS or iTunes feed will receive the mix directly. To download the file directly left click below to Dday One’s Bandcamp. You can also stream directly from here. This entry was posted on Monday, March 25th, 2013 at 5:29 am. It is filed under Podcasts, DDay One - In Session series and tagged with Riow Arai, Kraftwerk, Cybotron, Newcleus, 2 Live Crew, Dr Dre, Latin Rascals, The Swami, Ice T, Kool G Rap, Spyder-D, Fab 5 Freddy, Marley Marl. You can follow any responses to this entry through the RSS 2.0 feed.